Here’s a quick idea you could try to explore shapes with your child. 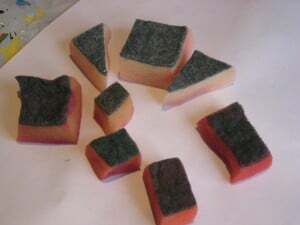 Take a kitchen washing-up sponge and cut it into different shapes using some scissors. We made rectangles, squares and triangles. Talk with your child about the shapes: How many sides do they have? What are they called? Can they see anything in the room the same shape? What pictures could you make with the shapes? 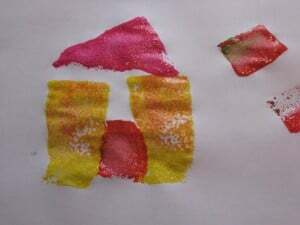 Then place some paint onto a shallow dish and show your child how you can dip a sponge shapes into the paint and then press it on to a piece of paper to make a print. Have fun experimenting to see what you can create… a house, a train, a spaceship? Little really enjoyed it too. What I like about the sponges is that you can make them into whatever you like. I think we’ll do numbers next time. super cute idea! I am all about kiddie art projects! Thanks for sharing!